A source in the Iraqi city of Mosul says members of the ISIS terrorist group are afraid of the ‘M’ letters written on the walls of their houses, as it apparently shows they will be the next victims of resistance groups. 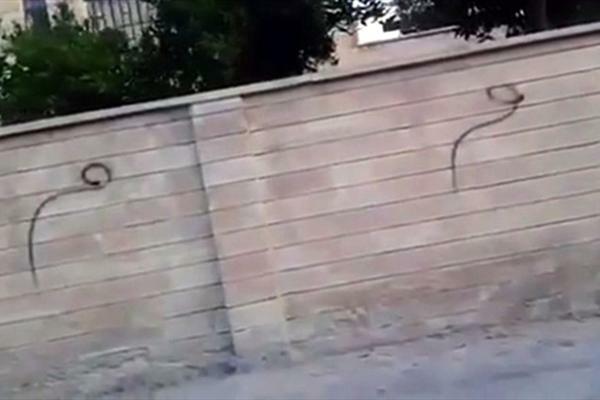 The source in the ISIS-held Mosul, who spoke on the condition of anonymity, told Al Sumaria News that unknown individuals have sprayed the Arabic letter ‘M’ on the wall of the house belonging to an ISIS commander named Abu al-Qa’qa’ in eastern Mosul. “This has made ISIS terrorists terrified,” the source said, as reported by Al Alam News Network and translated by IFP. The source said the popular groups are called ‘Mosul Brigades’ and write the Arabic letter which sounds like ‘M’ on the walls and houses of ISIS elements. “The letter ‘M’ is the first letter of the Arabic word ‘Muqawamah’ or ‘Resistance’,” it added. ISIS terrorists are extremely worried about the growing number of such moves, and fear that their rule is ended by popular forces and the Iraqi army, the source noted. Anti-ISIS moves have increased in Nineveh province, and the ISIS elements have been executing people publicly to intimidate the citizens. On the other hand, the Iraqi army is progressing towards Mosul. Many ISIS commanders have been killed so far in the ongoing operations by Iraqi forces.